And there’s a single website where you can read all about them. It’s called the Biographical Directory of the United States Congress, 1774-Present, and it’s presented and maintained by the historians of the House of Representatives. The individual entries, as you can see, are short but full of genealogical detail, with birth, death and occupational details. And many of the older records have rich bibliographies and links to other research collections. 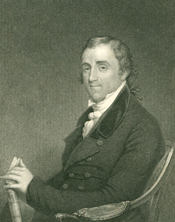 For Fisher Ames, for example, there are 10 items included in an extended bibliography ranging from a biography by Winfred Bernhard5 to a collection of Ames’ own speeches.6 And the research collections page for Ames includes 16 repositories ranging from the American Philosophical Society in Philadelphia to the Yale University Library’s manuscripts and archives collections. And there’s a whole online exhibit, Black Americans in Congress, at the House of Representatives history website, History, Art & Archives, to read more about the 139 men and women who have served in the House and the Senate since Revels and Representative Joseph Rainey of South Carolina became the first African Americans to serve in Congress in 1870. For more information about the women who have served over the years, the online exhibit Women in Congress at the House History, Art & Archives site is the place to go. Rich, documented details and great search features make this site a must for anyone who has a federal lawmaker in the family — or just wants to know more about the men and women who’ve given us our laws over the years. While history shows that a few were corrupt beyond measure, many of our early legislators were remarkably meek in comparison to the excess now seen in Washington today. Up until fairly recently, I’d say there were at least a few statesmen (and stateswomen) in the Congress, Bill. Wish we could say the same now. Thank you, Judy, for the fascinating information. I just have one question regarding Todd Young. It shows that he served in the U. S. Navy 1990-1991 and with the United States Marine Corps, 1995-2000. Where was he during the years 1992-1994? I’m doing a little reading-between-the-lines here, but since he was in the Navy first, then graduated from the Naval Academy in 1995, then was in the Marines from 1995-2000, I’d place a small wager on those being his years at the Naval Academy, Louise. And how amazing that Ms. Rankin was elected to the House when most women in the United States could not exercise their vote. Isn’t that amazing? And she won rather decisively in the election, too.